Hey there friends! So I’m not sure whether I’ve ever mentioned this here before but I love watching organizing videos on YouTube. I get such a high from watching others get just as excited about the organizing process as I do. Basically I often turn to YouTube if I need an organizing fix fast. Which is pretty often for this organizing junkie. This past week as I was watching Kathryn from Do It On A Dime organize her friend’s kitchen I couldn’t wipe the smile off my face. The kitchen organizing tips she provides in this video are just gold. I had to talk about this awesomeness with someone. Thank goodness I have a blog and all of you to share my organizing love with. 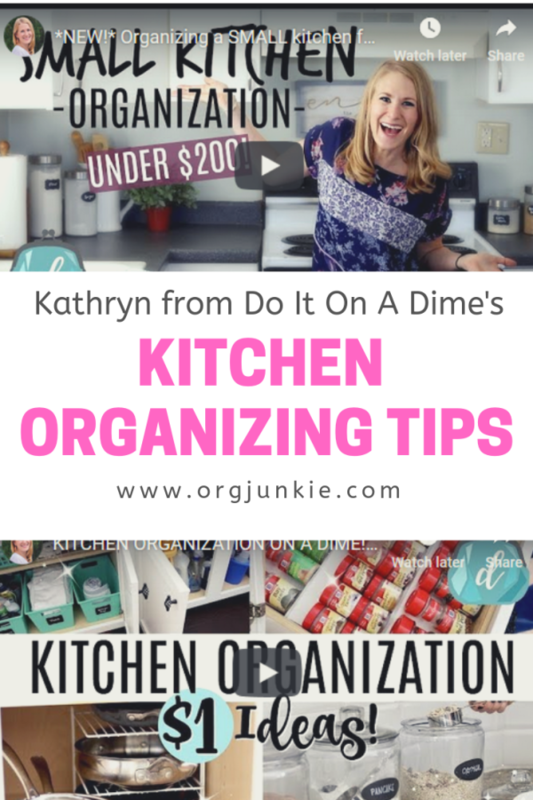 Anyway Kathryn has done a number of videos sharing kitchen organizing tips and I wanted to include three of them in this post so you could see why I love her so much. I’m going to embed them here to make them easy for you to view along with a few of my favorite highlights from each video. So many great takeaways to help you get your kitchens organized without breaking the bank! The first one is the one I mentioned above where Kathryn helps organize her friend’s kitchen. Do the decisions you’ve previously made about a space actually work for your life right now? Easy Dollar Tree organizing ideas, quick hacks and how to save big organizing in the kitchen. Kathryn shows you her favorite dollar tree solutions, motivation, and decluttering in another friend’s kitchen. 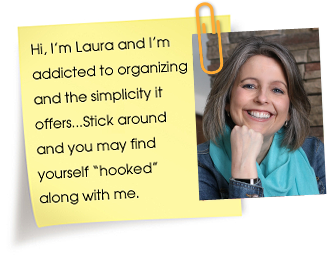 Your clutter is not the boss of you! So good right!? Kathryn is the just cutest and I think I would love hanging out with her in real life. But she doesn’t know me so I totally recognize how stalkerish that sounds. Oops. If you enjoyed these videos as much as I did, be sure to subscribe to Kathryn’s channel by visiting her channel directly HERE and clicking on the red subscribe button. Let’s help her get to 1 million subscribers. Can you even imagine such a feat? So amazing! And if you feeling inspired to tackle your own kitchens, here are all the kitchen organizing posts I’ve done for even more kitchen organizing tips. And my Amazon shop (affiliate link) where you can find my favorite kitchen organizing products all in one place. Always remember, your clutter is NOT the boss of you! Thank you for sharing Kathryn’s Videos. I usually only YouTube when I need to know how to do something. But I can watch Kathryn with a cup of coffee in the morning….beats combing Craig’s list for furniture bargains that I don’t really “need,” which is what I usually do with my cup of coffee after everyone else is out the door. She’s an inspiring way to start the day! She’s awesome, so glad you enjoy her now too!